I never realized how often I include caramelized onions in my cooking until I started to post my recipes. Caramelizing anything intensifies the flavors. Intense flavors are good. 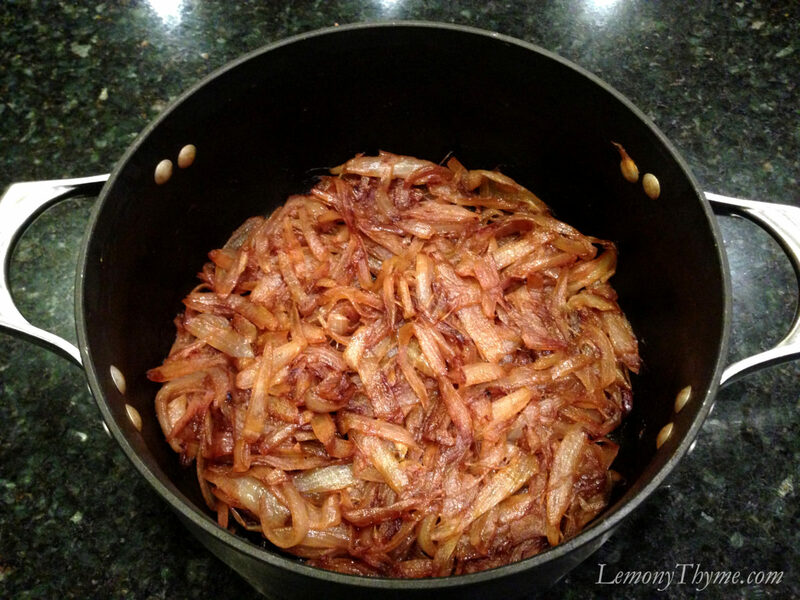 Here’s an easy step by step of Caramelized Onions. To make 1 cup of caramelized onions start with about 6 cups of sliced onions. A couple years ago I discovered a great way to slice onions when caramelizing. We all have our own onion slicing style but this was a cooking moment for me. Cut the top and bottom off the onions and remove skins. Cut onions in half, then thinking as if you were slicing thin pieces of pie, cut onion in wedges with knife point at the center of the onion. Heat Dutch oven over medium heat, add 2 Tbl. olive oil, 1 Tbl. butter until melted then add sliced onions & 1/4 tsp. salt. Cook about 15 minutes, stirring just a couple times during this period (if they appear to be burning turn down heat slightly). Onions should be softened and starting to brown. Reduce heat to medium-low and continue cooking until onions are a beautiful deep brown…..you’ll know. Caramelized Onions freeze well and keep in the refrigerator for up to a week. Make a double batch and you’ll have this star ingredient ready for recipe creation. This looks very yummy, but when should I put the sugar in the onions? Hi Julieta. I don’t add sugar to them. I let the natural sugars from the onion help to caramelize them.